The Orkney Islands have a wealth of history and beauty, in swan-filled lochs, spectacular sunsets over the sea, and landscapes populated by ancient stones. There's much to see, and we think you'll love the more relaxed pace of life here! In terms of historical sites, the Orkney Islands contain more to see per square mile than any other place in Britain - and simply touring the mainland alone could take a week. Within seven miles of Asgard is a perfectly preserved neolithic village, Skara Brae, which offers a unique insight into life 5,000 years ago. 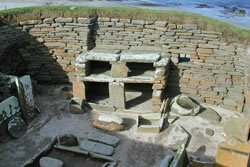 You'll see bed and cupboards and fireplaces used by prehistoric men and women. These houses were buried and preserved underneath the sand until they were discovered more recently! Travel another seven miles to the East of Asgard and you'll discover the massive ancient Standing Stones of Stenness and the standing stone circle, the Ring of Brodgar, which was used for mysterious purposes in 3,000BC. 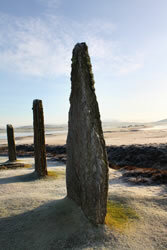 Try and work out for yourself what these standing stones could have been used for! 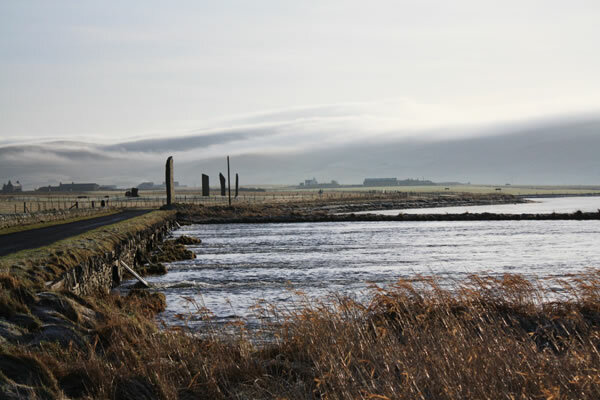 During the summer the dig at the nearby Ness of Brodgar offers important clues about religion 5,000 years ago, and is described as the most important archaeological dig in the world today! Or you can travel to the south isles (don't worry, no extra ferries are required: you can cross the Churchill Barriers by car) to see the Italian Chapel, a beautiful monument built during World War 2 by Italian Prisoners of War. There are 12 other islands to visit - from Westray, the Queen of the Isles, to North Ronaldsay, with it's sheep dyke and seals. 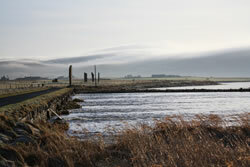 Most islands make great excursions for a day - giving you an opportunity to taste the many flavours of Orkney! We would particularly recommend the beautiful island of Hoy - the ferry to the island leaves from Stromness harbour, a mere seven minute walk from the doorstep of Asgard. On Hoy you'll find Orkney's best beach, Rackwick and the amazing sea stack, The Old Man of Hoy. 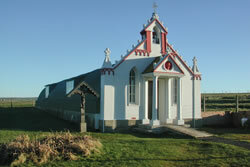 You'll find there's plenty to do in Orkney. 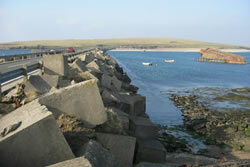 We've mentioned the many sights to see but have yet to mention the great lochs to fish, the WW1 wrecks of Scapa Flow to dive, the rare birds that land here in Spring and Autumn, the great golf course in Stromness to play, the amazing food and drink, and the lively festivals; such as the world famous Orkney Folk Festival. After all these adventures, find yourself back at Asgard Bed and Breakfast, where you can enjoy our powerful showers, our comfortable beds and in the morning a delicious breakfast to fuel you up, ready to go again! "Do we really have to leave tomorrow? It's too bad!" "Wonderful room, exceptional breakfast - best ever!"